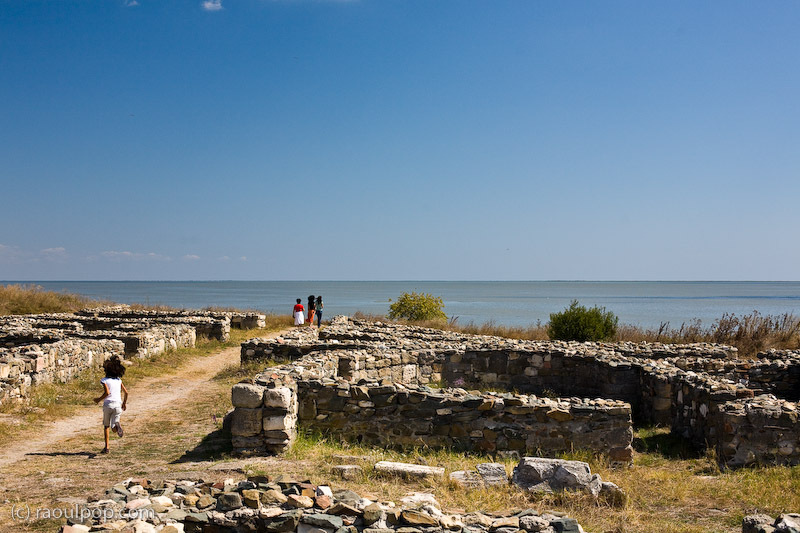 On the shore of Lake Sinoe in Romania, very close to the Black Sea, lie the ruins of the oldest documented city on the territory of modern-day Romania: Histria. 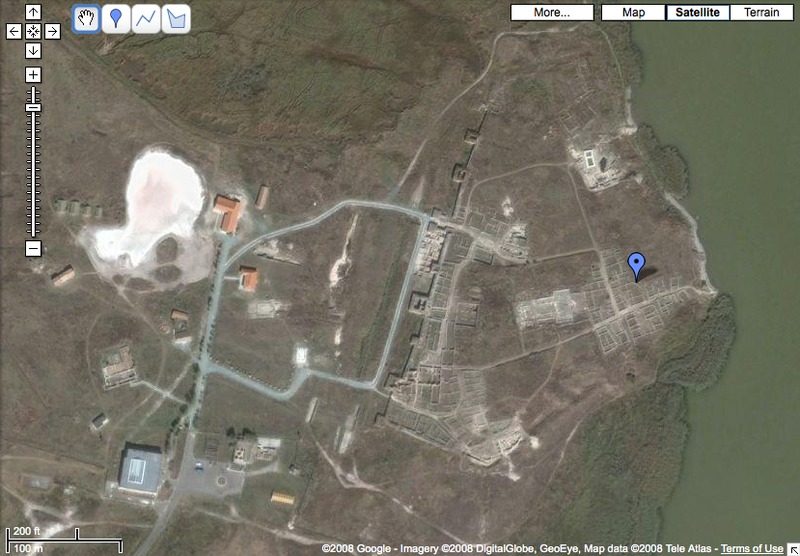 (See satellite view below, or go to Google Maps to explore the full map.) We visited it in September of 2008. It started its life around 630 BC [reference], built by Milesian colonists from Greece, to trade with native Getae tribes (Geti in Romanian). The Getae were Thracian tribes that occupied Dacia, whose territory is matched in smaller proportion by modern-day Romania. They, and the other people who settled in Romania at later times (like the Romans) are the ancestors of modern-day Romanians — my ancestors. 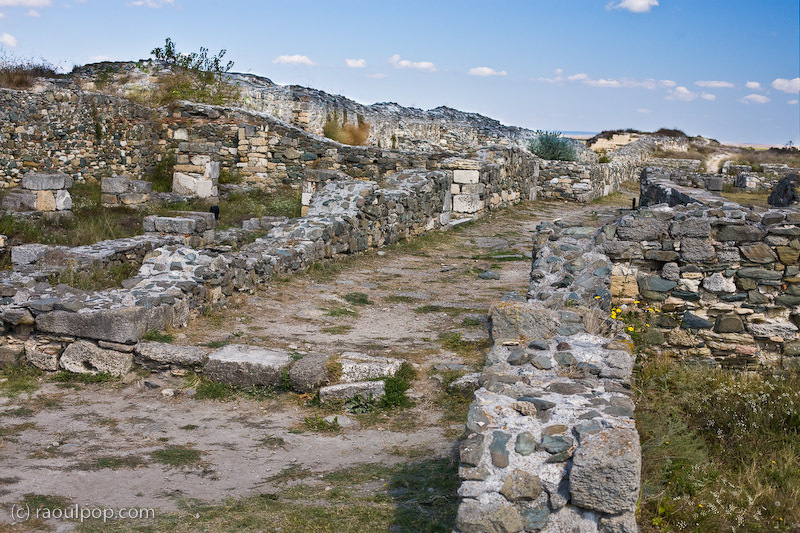 When Histria was built, its port was literally on the shore of the Black Sea. Over its approximately 14 centuries’ existence, silt deposits from the Danube River blocked off its access to the sea and formed what is now Lake Sinoe. This meant that the city’s importance as a port and trading post slowly diminished as the silt deposits grew to become the current land border between the Lake Sinoe and the Black Sea. It must have been painful to try and salvage the city’s livelihood by finding routes through the growing silt, hoping that ships stuck in the increasingly shallow water would somehow want to come back, should they manage to get away. Little did they know that in modern times, a canal would be cut through the silt shore at Periboin, not far from them. By 100 AD, the city, who had resisted countless attacks and rebuilt its walls time after time after time, could only rely on fishing as a source of income. It managed to survive another 600 years or so, until it was destroyed one last time in the 7th century AD by the Avars and the Slavs. Its inhabitants moved away, and the once bustling and prosperous city, who had forged an important trading link between the Greeks and the Dacians so many centuries ago, began to decay, unoccupied. Its name forgotten, it didn’t even appear on maps. Its memory swallowed whole by time, its walls covered by the ground itself, it lay in wait until it was re-discovered by a Frenchman, Ernest Desjardins, in 1868. In 1914, Vasile Parvan, a Romanian, began the first excavations of the site. The archeological digs continue to this day, conducted by various multinational teams. This was how we found it a month or so ago. It was a warm, sunny, late-summer day when we visited. 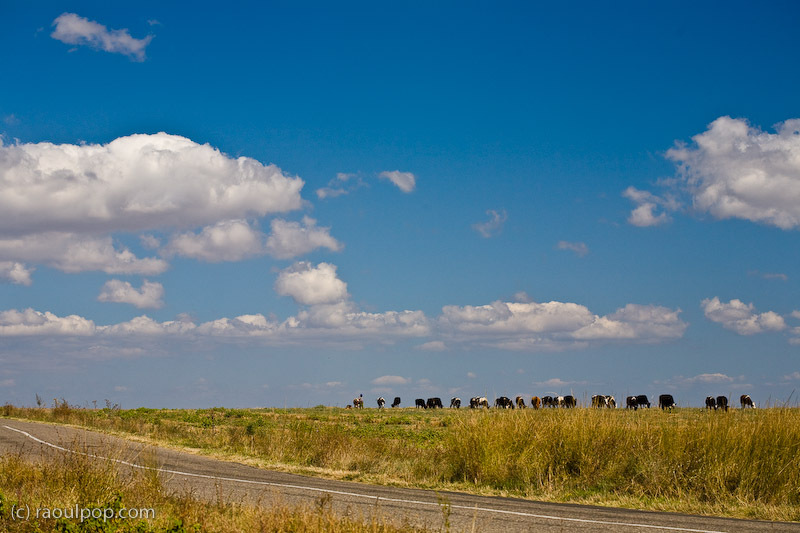 The heat shone down oppresively while we drove through the flat Dobrogea landscape. Yet a soft, cooling breeze from Lake Sinoe met us as soon as we stepped onto the grounds of the city. 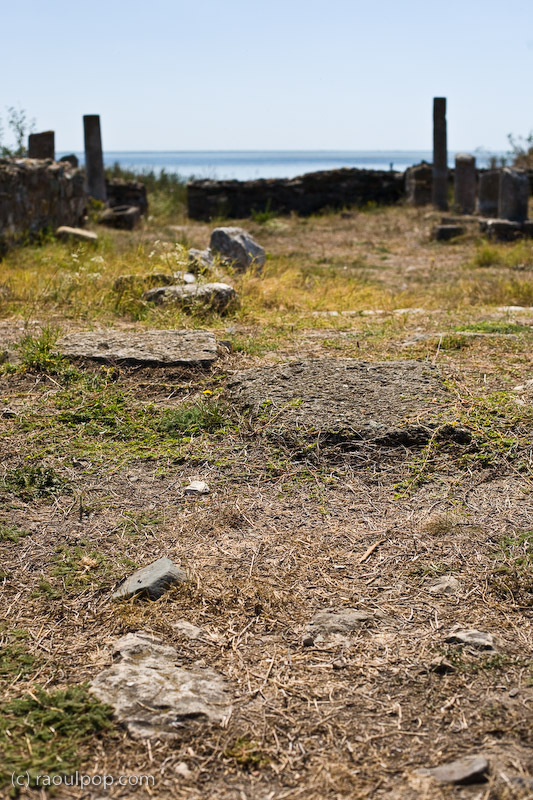 There was a peace and quiet at Histria that I can only find when I visit certain ruins. I stood among the remains of the walls, and thought of the people that lived there before I set foot on what used to be their homes. They were born, lived and died there, making a living the best way they knew how, in a famous city by the Black Sea. The breeze must have been stronger then, since the waves of the sea beat against the city’s very shores. What an adventurous spirit those Greek traders must have had, to get in their boats and travel far off, in hope of establishing a little colony of their own in an unknown land. How did they choose the site? Likely because it sits on top of a slight hill. Just think, the first few families built little homes out of field stone (there are very few trees around), and through hard work applied over time, grew that little settlement into an important port of trade and a fortress, one rich enough to attract the attention of countless attackers. As I sat there and listened to the lull of the waves, I understood why they rebuilt after each attacks. The peace between each bout of violence was worth the effort, and the surroundings themselves invited (and still invite) company. Had their direct access to the Black Sea not been cut off, I believe Histria would survived to this day, and perhaps the city of Tomis (Constanta) might have had a different fate. 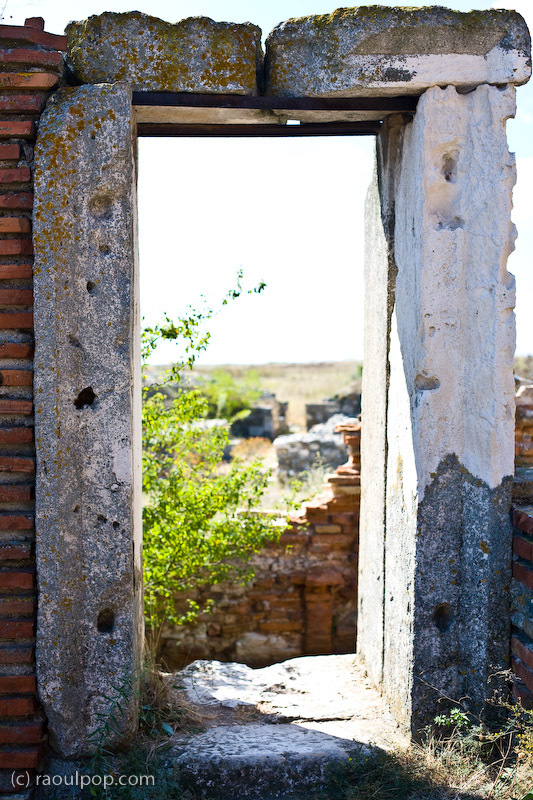 If you walk slowly among the houses or on the streets at Histria, you too will understand why it survived for so long. It’s hard to leave a place like that. It’s so peaceful, so quiet, so welcoming. You want to spend more time there, looking toward the horizon, hoping against hope to spot your ship, which is making its way slowly but surely toward the small port, bearing goods that will replenish your warehouse and provide for your family for another year. The full set of photos from Histria is available at my online photography catalog. You’re welcome to view them all there. Mircea Angelescu, a Romania researcher, developed a 3D model of Histria which can give you a detailed idea of the city’s layout over time. More info on Histria can be found at Wikipedia. Great review on the Histria ruins..I always enjoy your articles..well done..you seem to know more about Romanian history , then romanians themselves..:) ..the pics are great too..